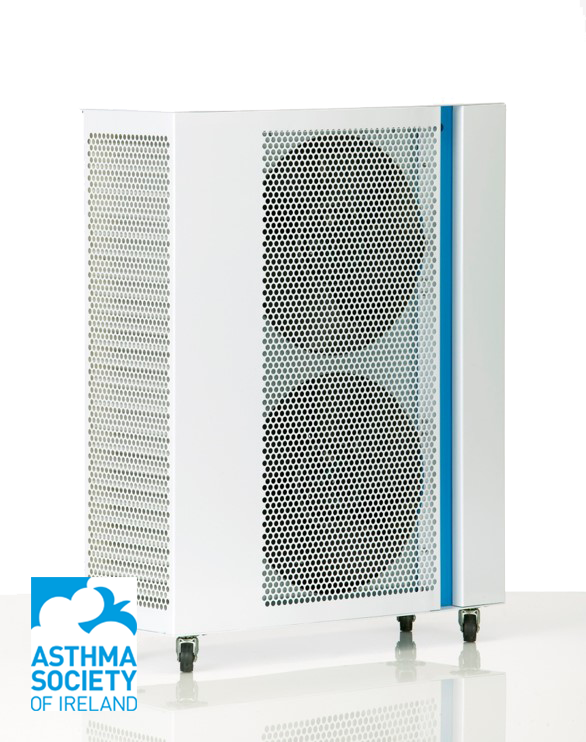 Proven to significantly improve air quality, as found in a recent Asthma Society of Ireland report carried out into indoor air quality in homes with and without an air purifier. The study concluded that the CliniAir unit significantly reduced the concentration of small particles in the home environment, beneficial for all inhabitants. The CliniAir unit is a specialist room air purifier designed to remove bacteria and viruses from the air. Proven effective in the reduction of asthma attacks through removal of pollen, dust mites and general dust in a typical room, changing the air up to 10 times per hour. Two synthetic HEPA filters with Clinicoat™ coating on the fibres which is has been certified as effective against over 100 bacteria, viruses, yeasts and moulds. Ultra-quiet and designed to be left running day and night. Filters to be changed every 3 months as part of a managed service. Low running costs of 44w. Contact Colum Duffy at colum.duffy@noel.ie or on +353 (0) 86 3803047 to discuss in further detail. Unit 10b, Santry Business Park, Santry, Dublin 9, Ireland. If you have queries about any of our products - we would love to hear from you.